Brooklyn is the most populous of New York City's five boroughs, with about 2.6 million people, as well as the second-largest in area. 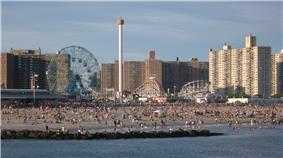 It is geographically adjacent to the borough of Queens at the western end of Long Island. Since 1896, Brooklyn has had the same boundaries as Kings County, which is the most populous county in New York and the second-most densely populated county in the United States, after New York County (Manhattan). Today, if it were an independent city, Brooklyn would rank as the fourth most populous city in the U.S., behind only the other boroughs of New York City combined, Los Angeles, and Chicago. Brooklyn was an independent incorporated city (and previously an authorized village and town within the provisions of the New York State Constitution), until January 1, 1898, when, after a long political campaign and public relations battle during the 1890s, according to the new Municipal Charter of "Greater New York", Brooklyn was consolidated with the other cities, boroughs and counties to form the modern "City of New York" surrounding the Upper New York Bay with five constituent boroughs. It continues, however, to maintain a distinct culture, as befitting the former second or third largest city in America during the later 19th Century. Many Brooklyn neighborhoods are ethnic enclaves where particular ethnic and nationality groups and cultures predominate. Brooklyn's official motto is Eendraght Maeckt Maght. Written in the (early modern spelling of the) Dutch language, it is inspired by the motto of the United Dutch Provinces (first Dutch Republic, predecessor of the current Kingdom of the Netherlands), (currently also the official motto of the neighboring Kingdom of Belgium) and translated "In unity, there is strength." The motto is displayed on the Borough seal and flag, which also feature a young robed woman bearing a bundle of bound rods known as a "fasces", a traditional emblem of Republicanism. 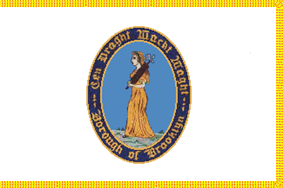 Brooklyn's official colors are blue and gold. Currier and Ives print of Brooklyn, 1879. Many incidents and documents relating to this period are in Gabriel Furman's early (1824) compilation. 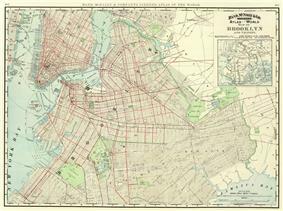 On August 27, 1776, the Green-Wood Cemetery, Prospect Park, and Grand Army Plaza. 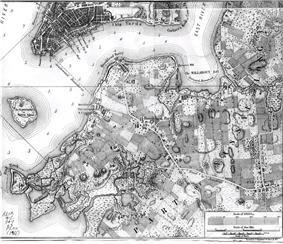 The fortified American positions at Brooklyn Heights consequently became untenable and were evacuated a few days later, leaving the British in control of New York Harbor. 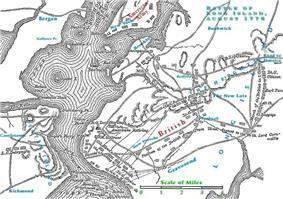 While Washington's defeat on the battlefield cast early doubts on his ability as commander, the subsequent tactical withdrawal of all his troops and supplies across the East River in a single night is seen by historians as one of his most brilliant triumphs. 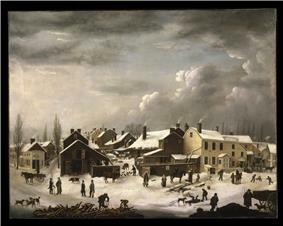 A preindustrial Winter Scene in Brooklyn, c. 1819–20, by Francis Guy (Brooklyn Museum). 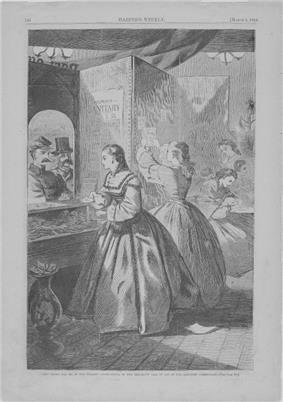 By 1841, the growing city across the East River from Manhattan, boasted its own highly regarded newspaper with the appearance of the The Brooklyn Eagle, and Kings County Democrat published by Alfred G. Stevens. It later became the most popular and highest circulation afternoon paper in America. The publisher changed to L. Van Anden on April 19, 1842, and the paper was renamed The Brooklyn Daily Eagle and Kings County Democrat on June 1, 1846. On May 14, 1849, the name was shortened to The Brooklyn Daily Eagle. On September 5, 1938, the name was further shortened, to Brooklyn Eagle. The establishment of the paper in the 1800s set a tone for the developing separate identity for Brooklynites in the next century along with its famous National League baseball team, the Brooklyn Dodgers. Both major institutions were lost in the 1950s, when the paper closed in 1955 after unsuccessful attempts at a sale following a reporters' strike and the baseball team decamped for Los Angeles in a realignment of major league baseball in 1957. As both a seaport and a manufacturing center, Brooklyn was well prepared to play to the Union's strengths in shipping and manufacturing. The two combined in shipbuilding; the ironclad Monitor was built in Brooklyn. 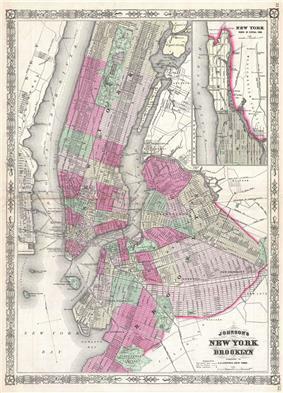 The Twin cities of Brooklyn and New York in 1866, showing wards. 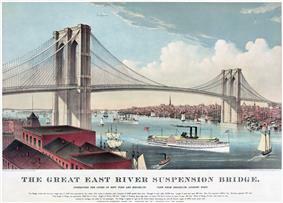 Brooklyn Bridge in 1883, by Currier and Ives. Each of the city's five counties (coterminous with each borough) has its own criminal court system and District Attorney, the chief public prosecutor who is directly elected by popular vote. The current District Attorney of Kings County is Kenneth P. Thompson, a Democrat elected in 2013. 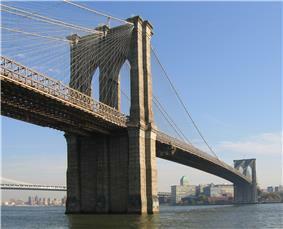 Brooklyn has 16 City Council members, the largest number of any of the five boroughs. Brooklyn has 18 of the city's 59 community districts, each served by an unpaid Community Board with advisory powers under the city's Uniform Land Use Review Procedure. Each board has a paid district manager who acts as an interlocutor with city agencies. The USS Missouri, built in Brooklyn Navy Yard in 1940-1944. Newer buildings near East River State Park in Brooklyn (2011). Jobs in the borough have traditionally been concentrated in manufacturing, but since 1975, Brooklyn has shifted from a manufacturing-based to a service-based economy. In 2004, 215,000 Brooklyn residents worked in the services sector, while 27,500 worked in manufacturing. Although manufacturing has declined, a substantial base has remained in apparel and niche manufacturing concerns such as furniture, fabricated metals, and food products. The pharmaceutical company Prospect Park in Crown Heights. Brooklyn Law School. 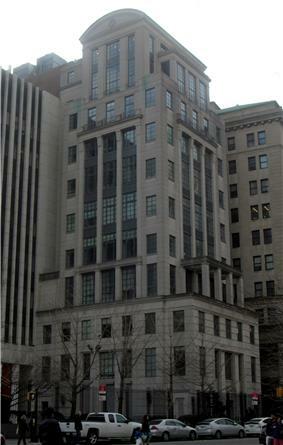 The 1994 new classical Fell Hall tower by NYC architect Robert A. M. Stern pictured. The New York University Polytechnic School of Engineering, the United States' second oldest private institute of technology, founded in 1854, has its main campus in Downtown's MetroTech Center, a commercial, civic and educational redevelopment project of which it was a key sponsor. 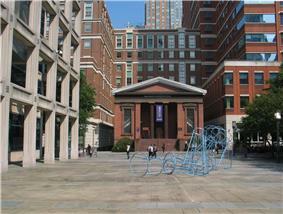 NYU-Poly is one of the 18 schools and colleges that comprise New York University (NYU). NYU-Poly is considered one of the best engineering schools in the world. Forbes.com regularly ranks NYU-Poly among the top 10 in its list of “Top Colleges for Getting Rich”. NYU-Poly is regularly ranked among the top 4 in the nation for alumni with the highest mid-career salaries by CNNMoney.com In 2012, NYU-Poly was ranked #21 by graduate engineering enrollment in the United States according to the American Society for Engineering Education. As of 2013, NYU-Poly ranks #19 by graduate engineering enrollment in the United States according to U.S. News & World Report. The Institute counts 5 Nobel Prize winners (2 Nobel Prize in Physics, 2 Nobel Prize in Physiology or Medicine, 1 Nobel Prize in Chemistry), 3 Putnam Mathematical Competition winners, 2 Wolf Prize in Physics winners, (1 Russ Prize, 3 Gordon Prize, 1 Draper Prize)(also known as Nobel Prizes of Engineering) winners, 2 Turing Award (also known as Nobel Prize of Nobel Prize of computing) winners, 2 W. Wallace McDowell Award (also known as Nobel Prize of Information Technology and Computer Engineering) winners, several National Inventors Hall of Fame inductees, several Congressional Gold Medal winners, 1 List of prolific inventors inductee, multiple Technology & Engineering Emmy Award winners, 3 Israel Prize winners and many Institute of Electrical and Electronics Engineers Awards winners (including 2 IEEE Edison Medal winners and 1 IEEE Medal of Honor winner). ^ a b c "Kings County (Brooklyn Borough), New York State & County QuickFacts". United States Census Bureau. Retrieved March 28, 2014. ^ "Population, Housing Units, Area, and Density: 2000", United States Census Bureau. Retrieved May 11, 2007. ^ Flags of the World, Brooklyn, New York (U.S.). Retrieved October 10, 2007. ^ "New York State Dept of Labor". Labor.state.ny.us. Retrieved October 24, 2010. ^ "FDIC Office Directory". FDIC.gov. Retrieved October 24, 2010. ^ "Credit Union Access". Credit Union Access. April 19, 2007. Retrieved October 24, 2010. 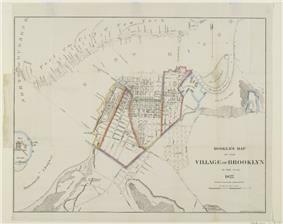 ^ Notes Geographical and Historical, relating to the Town of Brooklyn, i" by Gabriel Furman and Paul Royster (transcriber & depositor)""". Digitalcommons.unl.edu. 2006-03-21. Retrieved 2010-12-22. "State and County QuickFacts: New York (city), New York". "Kings County, New York QuickFacts". U.S. Census Bureau. Retrieved November 6, 2014. "Queens County, New York QuickFacts". U.S. Census Bureau. Retrieved November 6, 2014. "Nassau County, New York QuickFacts". U.S. Census Bureau. Retrieved November 6, 2014. "Suffolk County, New York QuickFacts". U.S. Census Bureau. Retrieved November 6, 2014. ^ "U.S. Decennial Census". Census.gov. Retrieved April 21, 2013. ^ "University of Virginia Library". Retrieved April 19, 2013. ^ """U.S. Census Bureau, "Residential Population and Components of Change New York State and Counties, April 1, 2000 to July 1, 2005. Retrieved August 4, 2006. ^ Tracy, Thomas (October 7, 2009). "Brooklyn’s LGBT community to join Washington march". New York Post. Retrieved October 24, 2010. ^ "Kings County (Brooklyn Borough), New York". State & County QuickFacts. U.S. Census Bureau. 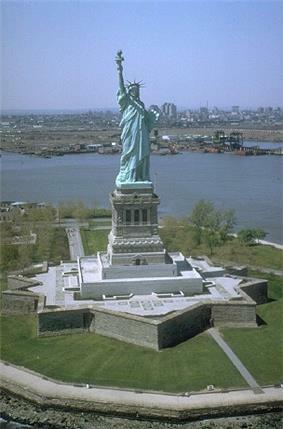 ^ a b c d "New York - Race and Hispanic Origin for Selected Cities and Other Places: Earliest Census to 1990". U.S. Census Bureau. Retrieved May 4, 2012. ^ "Kings County, New York". ^ Gibson, Campbell (June 1998). 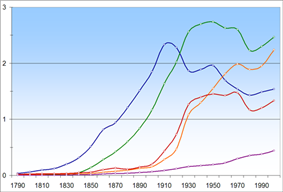 Population of the 100 Largest Cities and Other Urban Places in the United States: 1790 to 1990. U.S. Bureau of the Census – Population Division. Retrieved March 1, 2008. ^ "State & County QuickFacts: California". U.S. Census Bureau. Retrieved February 11, 2007. ^ Simone Weichselbaum (June 26, 2012). 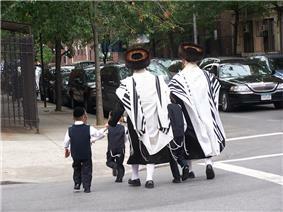 "Nearly one in four Brooklyn residents are Jews, new study finds". New York Daily News. Retrieved May 29, 2013. ^ "Brooklyn Technical High School, K430, Borough of Brooklyn , Zip Code 11217". Schools.nyc.gov. October 31, 2008. Retrieved October 24, 2010. ^ "Contact." ImpreMedia. Retrieved June 1, 2010. ^ a b Ward, Nathan (August–September 2005). "Brooklyn Rising". ^ . Retrieved June 29, 2010. ^ "Litchfield Villa". Prospect Park Alliance: Official WebSite of Prospect Park. Prospect Park Alliance. 2008. ^ "Audubon New York". National Audubon Society. 2008. Retrieved November 29, 2008. ^ Ebbets Field. Retrieved October 10, 2007. ^ Convissor, Daniel DOT Sees More Highways As Brooklyn's Road to Clean Air, Auto-Free Press, January/February 1992. Retrieved November 4, 2006. ^ "1968 NYCTA Expansion Plans (Picture)". Second Avenue Sagas. Retrieved December 2013. 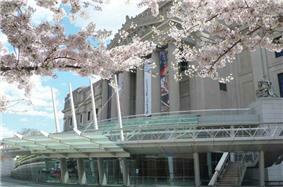 ^ Regional University North Rankings | Top Regional Universities North | US News Best Colleges. Colleges.usnews.rankingsandreviews.com (January 14, 2013). Retrieved August 15, 2013. ^ a b Kiplinger's Best Values in Private Colleges-Kiplinger. Kiplinger.com. Retrieved August 15, 2013. 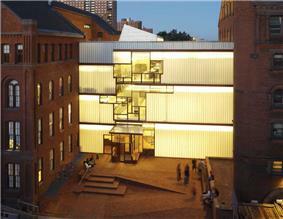 ^ Pratt Institute : The Ten College Campuses with the Best Architecture. Architectural Digest. Retrieved August 15, 2013. ^ "Sam Pitroda to give inaugural address at NYU engineering school". ^ a b "Best Engineering Schools". ^ New York University (NYU) Rankings. Top Universities. Retrieved August 15, 2013. ^ Academic Ranking of World Universities in Engineering/Technology and Computer Sciences - 2012| 2012 Top 100 Universities in Engineering/Technology and Computer Sciences |ARWU-FIELD 2012. Shanghairanking.com. Retrieved August 15, 2013. ^ NYU-Poly Recognition Continues in 2013. Downtown Brooklyn (February 21, 2013). Retrieved August 15, 2013. ^ "Top Colleges For Getting Rich", Forbes.com. ^ "Table: Colleges That Will Make You Rich", Forbes.com. ^ "http". //www.brooklynpubliclibrary.org. Retrieved October 24, 2010. ^ Net P.C. "Gdynia – International Gdynia – Twin Cities". Gdynia.pl. Retrieved October 24, 2010. ^ "Brooklyn Borough President". Brooklyn-usa.org. Retrieved October 24, 2010. ^ Markowitz joins Vienna deputy mayor to announce new "district partnership" (March 05)"(Borough Pres.)"BP . Brooklyn-usa.org. March 5, 2007. Retrieved October 24, 2010. ^ "Vienna in New York 2007 - (March 15, 2007)". Wieninternational.at. March 15, 2007. Retrieved October 24, 2010. ^ "Brooklyn in Leopoldstadt (July 5, 2007)". Wieninternational.at. Retrieved October 24, 2010. ""Becoming Wards One By One" The Brooklyn Daily Eagle(May 4, 1894). p. 12. Brooklyn's major professional sports team is the NBA's Brooklyn Nets. The Nets moved into the borough in 2012 and play their home games at Barclays Center in Prospect Heights. Prior to that, they had played in Long Island and New Jersey. The NHL's New York Islanders, currently based in Nassau County on Long Island, are planning to play in the Barclays Center (while retaining their current name) in 2015, which will make it the second major current professional sports franchise based in Brooklyn. 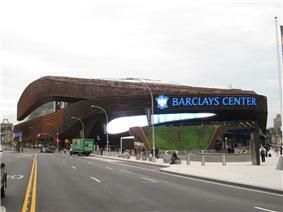 Barclays Center, located in Prospect Heights, is Brooklyn's major league sports venue. 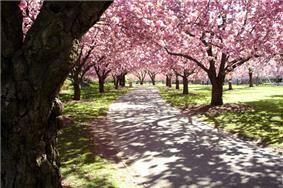 Prospect Park is a public park in central Brooklyn encompassing 585 acres (2.37 km2). 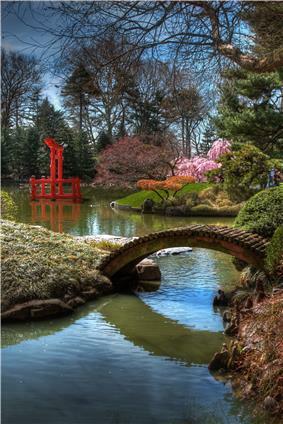 The park was designed by Frederick Law Olmsted and Calvert Vaux, who created Manhattan's Central Park. Attractions include the Long Meadow, a 90-acre (36 ha) meadow, the Picnic House, which houses offices and a hall that can accommodate parties with up to 175 guests; Litchfield Villa, the home of Edwin Clark Litchfield, an early developer of the neighborhood and a former owner of a southern section of the Park; Prospect Park Zoo; a large nature conservancy managed by the Wildlife Conservation Society; the Boathouse, housing a visitors center and the first urban Audubon Center; Brooklyn's only lake, covering 60 acres (24 ha); the Prospect Park Bandshell that hosts free outdoor concerts in the summertime; and various sports and fitness activities including seven baseball fields. Prospect Park hosts a popular annual Halloween Parade called the Halloween Haunted Walk, complete with a carnival for kids. The borough is home to the bi-weekly cultural guide The L Magazine and the arts and politics monthly Brooklyn Rail, as well as the arts and cultural quarterly Cabinet. Brooklyn Based is Brooklyn's most highly read email-based newsletter. 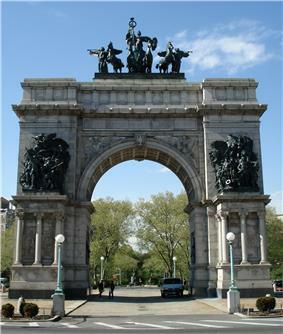 The Soldiers' and Sailors' Arch at Grand Army Plaza. Brooklyn's West Indian community is concentrated in the Crown Heights, Flatbush, East Flatbush, Kensington, and Canarsie neighborhoods in central Brooklyn. 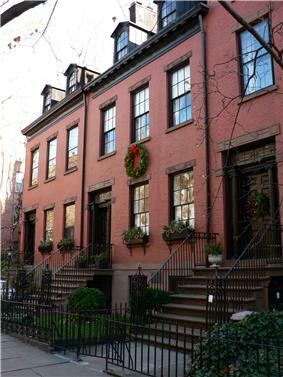 Brooklyn is home to one of the largest communities of West Indians outside of the Caribbean, being rivaled only by Toronto, Miami, Montreal,and London. Although the largest West Indian groups in Brooklyn are mostly Jamaicans, Guyanese and Haitians, there are West Indian immigrants from nearly every part of the Caribbean. Crown Heights and Flatbush are home to many of Brooklyn's West Indian restaurants and bakeries. 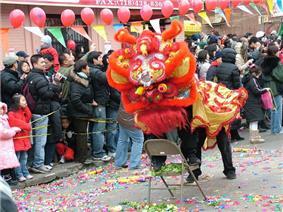 Brooklyn has an annual, celebrated Carnival in the tradition of pre-Lenten celebrations in the islands. Started by Trinidadians, West Indian Labor Day Parade, takes place every Labor Day on Eastern Parkway. Bushwick is the largest hub of Brooklyn's Hispanic American community. Like other neighborhoods in New York City, Bushwick's Hispanic population is mainly Puerto Rican, with many Dominicans and peoples from several South American nations as well. As nearly 80% of Bushwick's population is Hispanic, its residents have created many businesses to support their various national and distinct traditions in food and other items. Sunset Park's population is 42% Hispanic, made up of these various ethnic groups. Brooklyn's main Hispanic groups are Puerto Ricans, Mexicans, Dominicans, and Panamanians, they are spread out throughout the borough. Puerto Ricans and Dominicans are predominant in Bushwick, Williamsburg, and East New York. While Mexicans are predominant in Sunset Park and Panamanians in Crown Heights. Brooklyn contains dozens of distinct neighborhoods, representing many of the major ethnic groups found within the New York City area. The borough is home to a large African American community. Bedford-Stuyvesant is home to one of the most famous African American communities in the city, along with Brownsville, East New York, and Coney Island. "Bed-Stuy" is a hub for African American culture, often referenced in hip hop and African American arts. 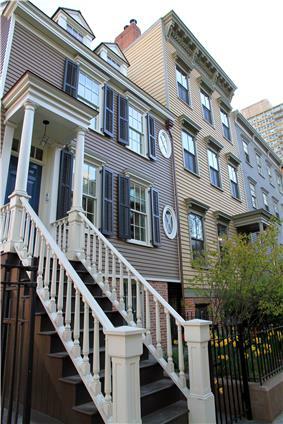 Brooklyn's African American and Caribbean communities are spread throughout much of Brooklyn. Since 2010, the population of Brooklyn was estimated by the Census Bureau to have increased 3.5% to 2,592,149 as of 2013, representing 30.8% of New York City's population, 33.5% of Long Island's population, and 13.2% of New York State's population.